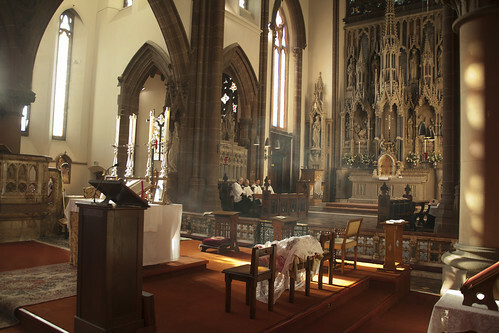 On Saturday I was present at a High Mass inaugerating the ministry of the Fraternity of St Peter, FSSP, in St Mary's, Warrington. 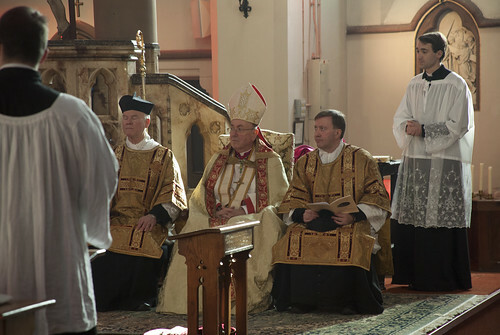 Archbishop Malcolm McMahon of Liverpool, the Ordinary, presided at Mass. Abbot Cuthbert Madden of Ampleforth (who of course I know), whose community had looked after the parish since 1770 and had built the present church, was in choir. 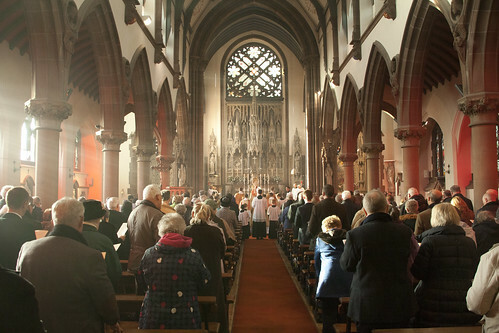 The church was packed to the doors. 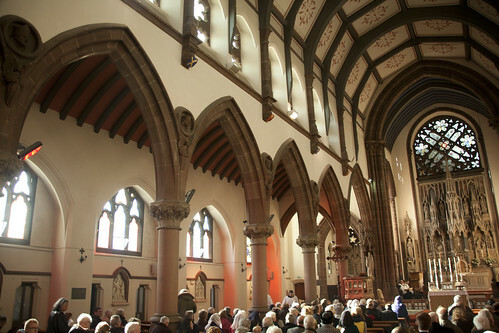 The Mayor of Warrington and his wife were present, and a good number of local clergy, including Canon Scott Tanner of the Institutes of Christ the King. 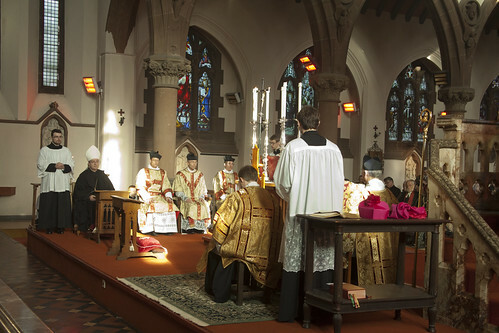 The church, designed and built by the second-generation Pugins, has emerged largely unscathed from the liturgical changes. 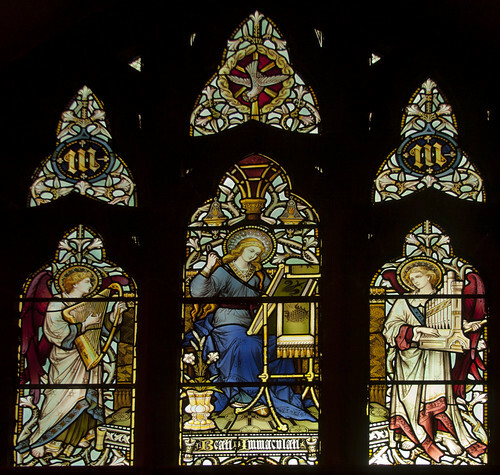 It is very impressive, with some superb features, such as this lovely stained glass from Hardmans' workshop. 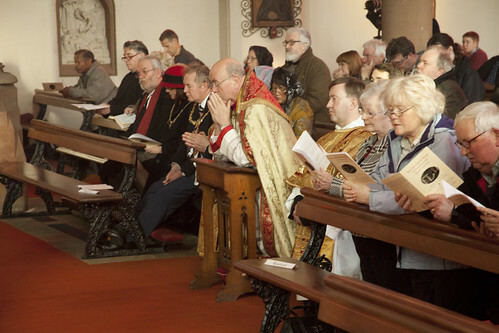 A large platform has been created in the nave, with a rather square altar on it, so Mass could be said versus populum: it is also possible to say Mass at this altar facing East, as was done on Saturday. The platform is made of wood and it won't be too difficult to remove it. 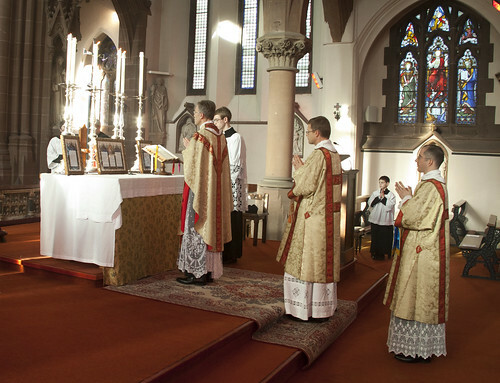 The only really sad thing to see is the original altar has been turned into a shelf, making it impossible to celebrate Mass there. The original stone altar frontal is, I think, the one there still, but the altar is now only 6 inches or so wide, and the step in front of it has been removed as well. Restoring that will be perfectly possible, it will just take a bit more effort and expense. 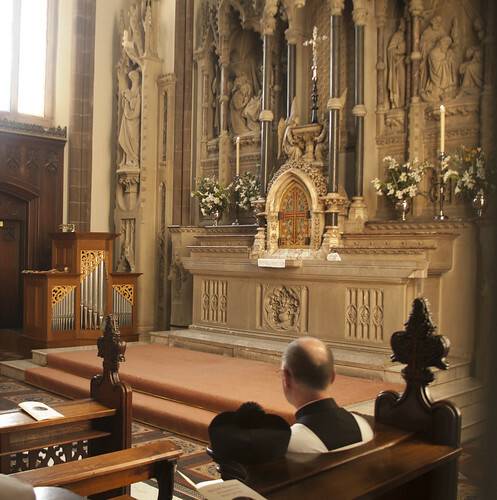 Overall, netherless, the church is really splendid, and local Catholics, and even non-Catholics, are clearly deeply committed to its continued role in the community. 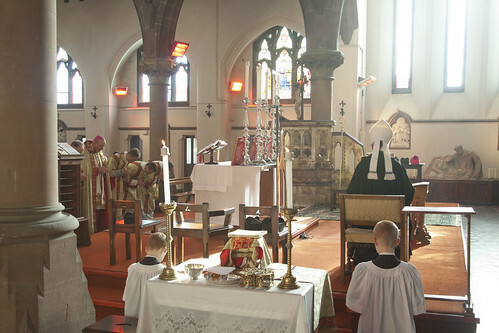 So, naturally, are Catholics attached to the Traditional Mass, who came to this Mass from far and wide, not only me from Oxfordshire but from Wales and Scotland and - even more impressive - from the other side of the Pennines. 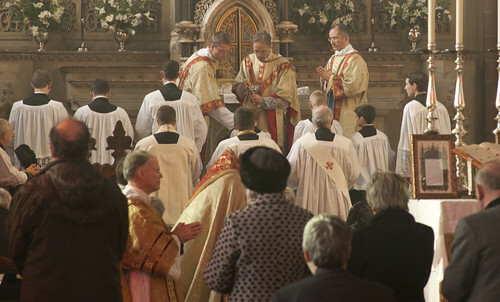 We all wish Fr de Malleray and the Fraternity of St Peter the very best in making a success of this apostolate. 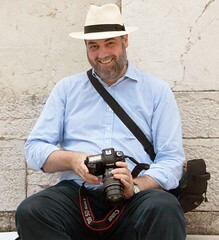 More photos by me here; and by Martin Gardner (including photos of me) here. I give it a week before they remove the ghastly proscenium. I'll bring my chisel. Perhaps, like the tunnelling operations in "The Great Escape" you might linger after Mass each Sunday and remove one chip at a time until the deed's done. It's wonderful to see this. 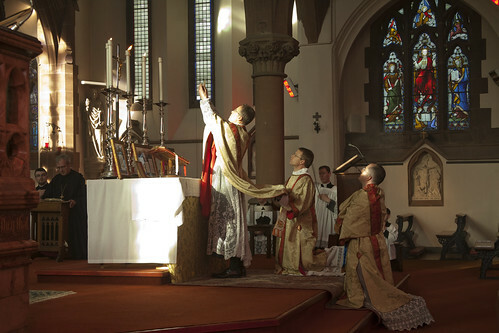 Perhaps it is the beginning of the return to the faith in England which St. Jean Marie Vianney both prayed for and expected some day.